Nikhil Siddhartha and Lavanya Tripathi are currently busy with their upcoming project, which was tentatively titled Mudra. However, there were some complications with regard to the title of the movie. Apparently, another movie was also titled Mudra and it featured Jagapathi Babu and J.D. Chakravarthy in prominent roles. This Jagapathi Babu starrer was released a couple of days back. The makers of Nikhil’s project did not register the name of the movie at the Film Chamber and as a result, another producer took the title. To avoid further confusion and issues, Nikhil’s project was retitled and a new poster was released today. Nikhil’s new project is titled Arjun Suravaram. Sam C.S. is composing the music for Arjun Suravaram while T.N. Santosh is directing it. Surya is handling the cinematography of Arjun Suravaram. This project is the remake of the Tamil movie Kanithan. Nikhil is going to play the role of a journalist in this movie, while Lavanya is going to feature as the female lead. Kaviya Venugopal and Rajkumar are bankrolling this project. 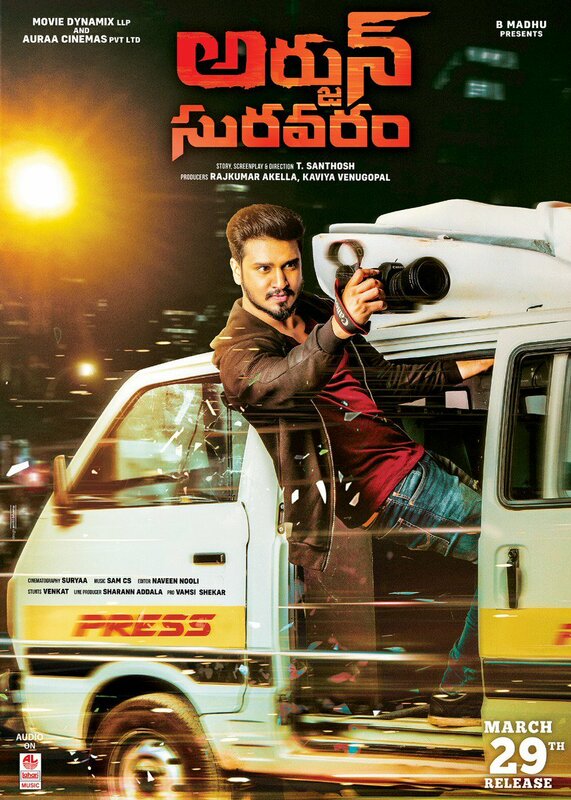 Arjun Suravaram is all set for a worldwide release on the 29th of March, 2019.